His stellar play between the pipes and a compelling Stanley Cup chase are keeping people up into the early morning hours in his native Switzerland. Jonas Hiller hopes that doesn’t change any time soon. After an emotional on-ice celebration in front of a raucous Calgary home crowd, in what was a hard-fought victory over the defending Cup champion Los Angeles Kings on April 9, Hiller (who stopped 33 of 34 shots) and his teammates headed back to the dressing room to continue the festivities. 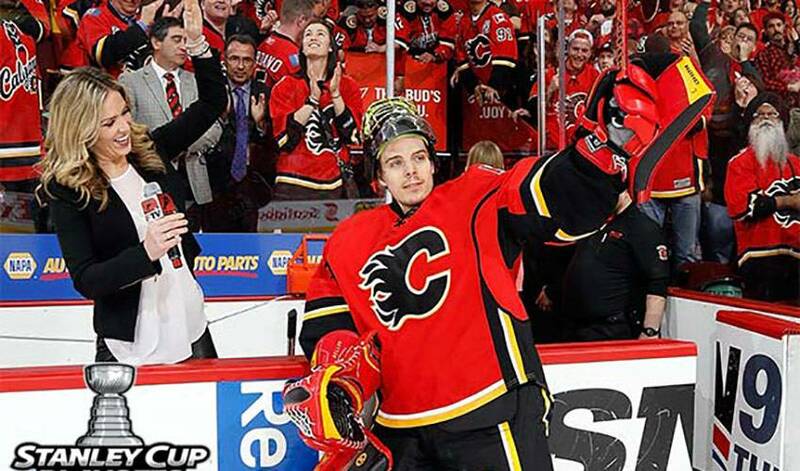 When he had the first chance to check his cell phone, Hiller chuckled, momentarily taken aback by the number of congratulatory messages people had left for the Flames’ No. 1 goaltender. Hiller hadn’t expected such an immediate reaction from friends and family back in Switzerland considering there’s an eight-hour time difference. The Canucks and Flames will renew their rivalry in the first-round of the Western Conference playoffs. Hiller and Raphael Diaz (who played six games with Vancouver) represent Calgary’s Swiss connection, while Yannick Weber, former Flame Sven Baertschi and Italian-born, but Switzerland-raised Luca Sbisa, comprise Vancouver’s Swiss contingent. Consider it a spin on Hockey Night in Canada – Hockey Morning in Switzerland, if you will. Hiller admitted he could have been talking to a travel agent soon if it weren’t for a spirited Calgary side that refused to lose when the big games were on the line. And while neither the Flames nor the Canucks were a consensus pick to make it to the post-season dance, both squads more than held their own against their respective competition. There are plenty of storylines to be found in their quarterfinal clash, but only one side will move on to the Western semis. Hiller has unwavering faith in his teammates. A playing style that can ignite a city’s passion and keep an entire country from turning in early.